“Be a team player”. We hear this statement throughout our lives. While you’re in school, while you are playing sports, in our first careers – we hear about the need to be a team player and stay positive. We go through our lives and careers being told how to be a team player. But what we don’t learn early enough is there is a fine line between being a team player and being able to set boundaries for your life and career that allow for balance. Many of us are the first people to volunteer for things in the office like committees or to be a mentor to a new employee as well as the first to volunteer in our personal lives as coaches, community volunteers, and leaders. Most of us do it because we love being a part of something that is having an impact, but when we are too much of a team player we begin to resent and dislike these extra-curricular activities because we are saying yes to too many things. It’s not that we need to say no to everything someone asks us to do, it’s that we need to assess the commitment and make sure we can fully commit and give that effort what it needs. And sometimes, that means saying no when you can’t and realizing that people will respect you for being honest about your ability to fully commit to the effort. And those efforts that you do commit to will be much more fulfilling because you will give them the focus and energy that they need to be successful. 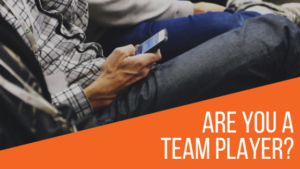 What we all need to be aware of is that when we personally sign up for too much or we have employees that are team players, we need to make sure we are assessing our commitments before we hit “burnout”. Once burnout happens we see turnover and people leaving their current roles, setting new boundaries to their careers and starting fresh. What happens if you’re the individual who doesn’t know how to set boundaries with your clients, customers, or even your own team? You need to sit back, understand where your strengths are and what is your why is for the work you are doing right now. You need to remind yourself what your true passion is and consider those things that drove your business or career, to begin with? In these situations, you need to take it back to basics and take inventory of where you want to spend your time for the highest level of energy. We need to learn to be a little selfish because everyone will always need and want more from you, but you have to set those boundaries because it’s the best thing you can do for yourself and your business/career. Think about where you are at in your life and career, where do you need to set some boundaries and how can you make sure you are focusing your efforts where they are needed to create the most impact? Focus on one step at a time, taking back a little piece of your time or setting respectable boundaries based on your current job or role in your community.